Sprawling crocodylians walk straight even if there isn’t much O2 to go around. 5 Responses to So, why go bipedal? Maybe it’s to assist in breathing as well. Reptiles that don’t use gular pumping basically have to hold their breath during a quadrupedal sprint due to the way lateral flexing squeezes their lungs. That is certainly possible. However, the authors noted that endurance was negatively correlated with bipedality. Lizards that ran bipedally tended to do so for a smaller amount of time. That said, their analysis wasn’t particularly robust for this factor (r2 = 0.40 for phylogenetically corrected data), so it remains a possibility. I agree with you that bipedal lizards should be able to run and breathe at the same time. What I would like to see is a setup that directly measures breathing ability while moving bipedally. Yeah, an escape sprint tends to be mostly anerobic anyhow. I was thinking of how Chlamydosaurus kingii goes bipedally while foraging. I’m wondering how it’s “jogging” endurance would compare to lizards that can maintain a “jog” with gular pumping. How many lizards can do a gallop like crocodiles sometimes do? That gait should allow sufficient breathing as well. These are all good questions that currently lacking any good answers. Although C. kingii is known to move bipedally, there is remarkably little information on how it does so and what the physiological ramifications of this locomotion are. 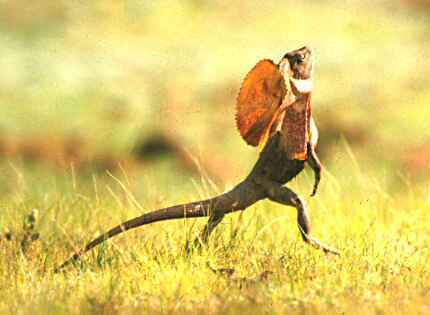 As for the bounding gallops that we see in crocodylians, I haven’t seen any video or literature references to lizards locomoting this way. The closest thing that comes to mind is a video I saw years ago at the Society of Integrative and Comparative Biology Meeting (SICB). It was on how lizards avoid obstacles while running and it featured a collared lizard (Crotaphytus collaris). The researchers filmed the lizards moving over obstacles. In one video in particular, I remember seeing the lizards hop on one rock and immediately hop to the next rock and then hop off and continue running. The move looked nearly identical to a croc gallop. So I would say that the capability of bounding is there in some lizards, but I don’t know if any species has ever taken advantage of it. It would seem odd if none of them did. On the one hand, some habits are just hardwired into an animal’s brain, but on the other, they often do a lot of weird unexpected crap too. I could picture one of the more leggy lizards doing a kangaroo-like bounding with with the tail counterbalancing and the front legs mostly preventing a faceplant.